Every day seems to get busier. I promised myself that this year I would make a little more time for some "me moments". This could be anything from taking a break to paint my nails to eating a delicious snack while looking through an old favorite cookbook. Just one moment a day where I can take a deep breath and let go of some stress. A yummy snack idea came to my mind the other day when I was shopping at Walmart. I stayed at a resort and spa a couple summers ago and in the spa they served some delicious bars. I believe the bars were made with peanut butter, oatmeal and some nuts and fruit. They were so good and I grabbed a few extra to take with me to my room. 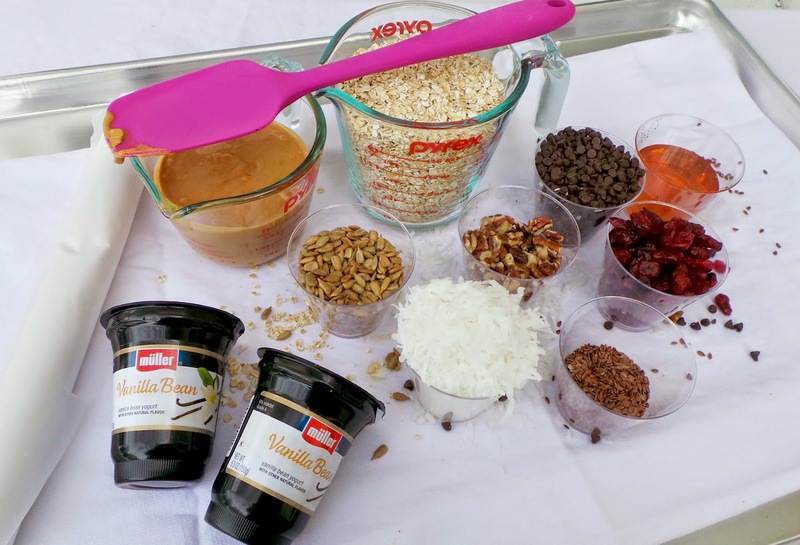 I thought that I could make something similar to the bars to have at home and the New Muller Ice Cream Inspired Yogurt would be perfect for my recipe. Muller Ice Cream Inspired Yogurt is just the right amount of wrong. The perfect indulgence that we all deserve! While shopping at Walmart I found Muller Ice Cream Inspired Yogurt that is a better-for-you alternative to ice cream and other treats. There were three flavors: Raspberry Chocolate Chip, Mint Chocolate Chip, and Vanilla Bean. All are equally delicious and definitely remind me of my favorite ice cream! I found these in the yogurt/dairy aisle of my Walmart store right in the middle of all the different yogurts. There is also a wonderful coupon that I found in my 1/4/15 Sunday paper for $1 off 5 (offer valid until 2/15/15). 1. 8 oz of Muller ice cream inspired yogurt in Vanilla Bean (there will be leftover for a little snack) You can use any of the other flavors if you want to swap! These are 5.3 oz each and a great source of protein. **The rest are optional/as you like and amounts may vary but I used them all! I do recommend adding in at least two additions. Feel free to add-in or switch out anything you wish. Maybe you enjoy cashews and dried cherries more ect... Just be sure to only use six additions maximum or the mix will be too dry. 3. Use a teaspoon sized scoop to portion balls out onto a sheet of wax paper that has been placed onto a cookie sheet. You may roll the balls if you want them to be more uniform but I like mine as is. I press into a cookie dough baller tightly and that seems to work perfectly, keeps hands clean too. 4. Set the tray full into the freezer (covered with plastic wrap or more wax paper) for roughly 20 minutes so they set up. 5. Store in a wax paper lined sealed container in the refrigerator. I like to place extra sheets of wax paper in between each new layer of bites. I like to use mine up within a week but they usually do not even last that long with my family. 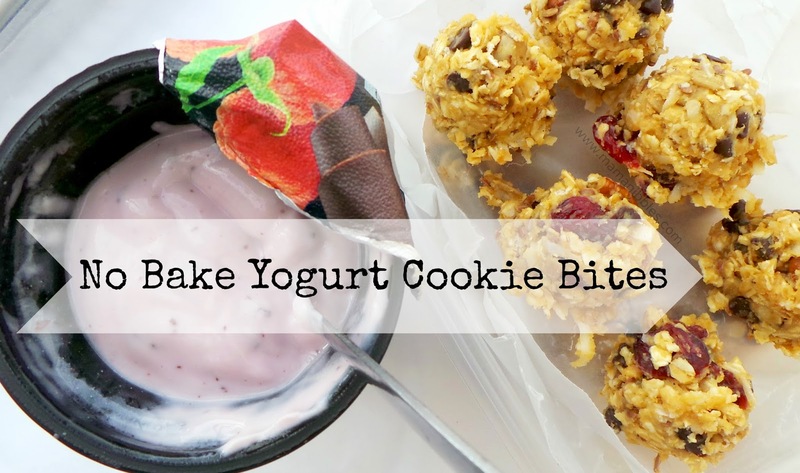 These make excellent snacks on the go or for a quick "me moment". They are just so delicious! I even like to enjoy them with a cup of the yogurt we used inside of these, it is the perfect pairing. You can feel good about eating dessert first! How will you enjoy your "me moment"? Visit Muller on Facebook and Twitter.